When you are editing a PowerPoint Presentation, you may need to add some media contents into it. For example, adding an interesting picture, a short video clip or a suitable background music to your PowerPoint Presentation will make your demonstratemore impressive to your audience. Usually, we are used to listening to music online or just downloading the music from iTunes - you need to pay for them. So, when we need to add some music to the PowerPoint Presentation, we may firstly search into the iTunes library on our computer. However, when you click the insert button on the PowerPoint Presentation operating menu, you can't find the songs you want to insert. Why? There is a format problem you haven't realized. The music songs downloaded from iTunes are packaged in M4P or M4A format which is not supported by PowerPoint Presentation. Audio file formats compatible with PowerPoint 2003/2007 include: AIFF, AU, MIDI, MP3, WAV, WMA. Among them, MP3 is the most familiar to us, with its small size and good sound quality. So if you want to insert iTunes music to PowerPoint, you are suggest to convert iTunes M4P/M4A songs to MP3 format for adding to PPT. 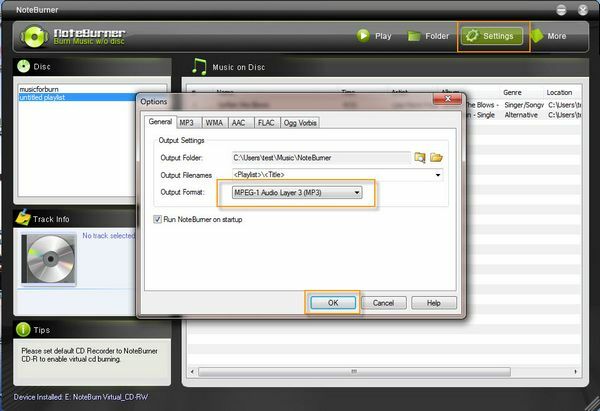 NoteBurner Audio Converter for Windows is a top iTunes music to PPT converter works on Windows XP/Vista/7 and Windows 8. With a powerful virtual CD burner, NoteBurner Audio Converter is able to remove DRM from iTunes audio files and convert them to various of common audio formats like MP3, AAC, WMA, and etc for playing on MP3 players, Android phones and tablets. This article will show you how to remove DRM copy protection from iTunes music and convert iTunes M4P to MP3 for you to insert into PowerPoint Presentation. Step 1. Launch NoteBurner iTunes music to PPT converter and click the settings button on the tool bar. 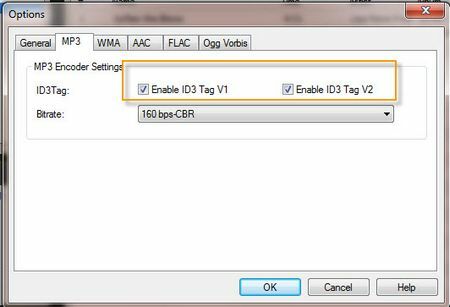 Choose MP3 format for output in General Option and check the blanks before Enable ID3 Tag V1 and Enable ID3 Tag V2 in the MP3 Option. Step 2. Launch iTunes create a new playlist. Add the music songs you want to insert to PPT to the new playlist you have just created. Right click at the playlist and choose Burn Playlist to Disc. 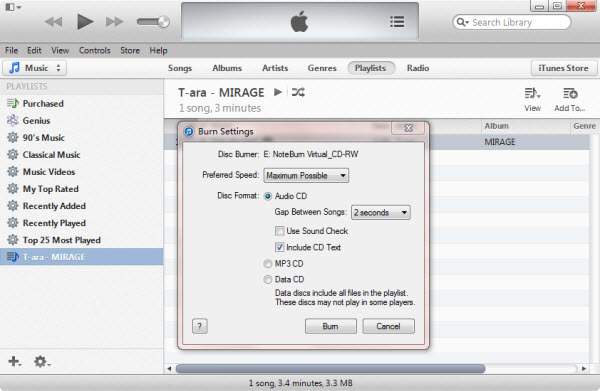 Then you will see a pop window, just choose NoteBurner Virtual_CD-RW in the first option, and then click Burn button to start to burn iTunes M4P music to MP3 format. Step 3. 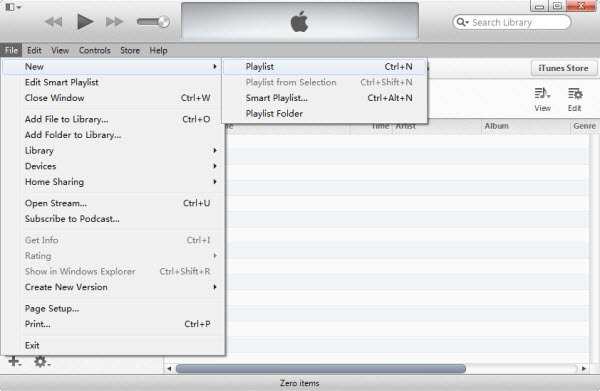 When the conversion is finished, the converted playlist and songs will be displayed on the main interface of NoteBurner iTunes M4P to PPT converter. 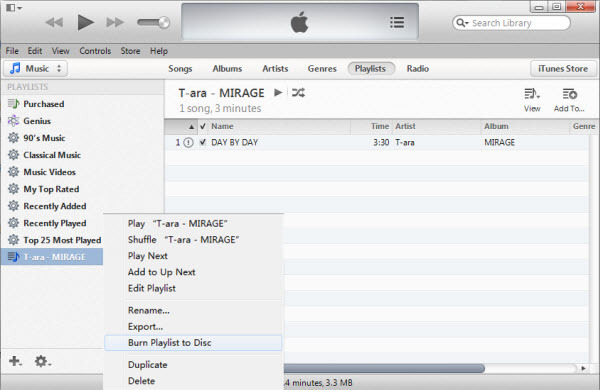 Then you can click the folder button to find the converted MP3 files. Freely copy and paste them onto the desktop so that you can easily click the insert option to import the converted iTunes music to PowerPoint Presentation. a. Go to the slide where you want to add the iTunes MP3 sound. Select Insert -> Movies and Sounds -> Sound from File to insert the sound file from your local drive. Click OK.
b. Then you will see a message pop up asking how you want the sound to start in slide shows. Click Automatically.